The present invention provides a retrofit system for configuring a vehicle into a hybrid electric vehicle or electric vehicle. The system comprises an electric power source (EPS) comprising one or more motors to provide fail safe torque to the vehicle and harness braking energy for charging one or more batteries, one or more attachable electric power gear assemblies (EPGA) configured to couple the one or more motors to a propeller shaft for providing the torque to the vehicle, and an electronic control unit coupled to the electric power source (EPS) for dynamically controlling functioning of the one or more motors based on the running conditions to drive the vehicle. The system comprises of a motor controller to control functioning of one or more motors. The motor controller actuates one or more motors based on the torque and power required to drive the vehicle. 本发明通常设及混合电动车，并更具体地设及用于将车转换为混合电动车或者电动车的一种系统。  The present invention is generally provided and hybrid electric vehicles, and more particularly to a system and arranged to convert the vehicle to a hybrid electric vehicle or an electric vehicle. 混合电动车化EV)和电动车化V)目前正经历日益增长的需求，归因于矿物燃料的日益缺乏W及自传统内燃引擎车辆中排放的二氧化碳。  Hybrid electric vehicles of EV) and electric vehicles of the V) is currently experiencing growing demand, due to the increasing scarcity of fossil fuels and carbon dioxide from W traditional internal combustion engine vehicle emissions. EV完全利用电力驱动马达，依靠存储在电池中的电能向车辆供电来运行。 EV electric drive motor fully utilized, relying on the electric energy stored in the battery power to run the vehicle. 皿V利用内引擎和/或电能驱动马达来向车辆供能。 V dish using the engine and / or electrical energy for energizing the drive motor to the vehicle. 混合汽车通常能达到比传统内燃引擎供能的车辆改善25%-40%的燃油经济性。 Hybrid cars usually reach than traditional internal combustion engine for a vehicle can be improved by 25% -40% of fuel economy. 目前，肥V/EV的概念用于重型车辆，如公交大己。  At present, the concept of fertilizer V / EV for heavy vehicles, such as buses large hexyl. 考虑到具有16吨车辆总重(GVW) 的公共交通己±(电力或混合电力己±)通常覆盖大约200公里的城市一天行程。 Considering the public transportation has been ± 16 tons gross vehicle weight (the GVW) of (± electric or hybrid electric power hexyl) typically covers about 200 kilometers daily city trip. 假设己± 在一个己±站花费的平均时间是约一分钟。 Assuming an average time in a hexyl hexyl ± ± station takes about one minute. 并且，考虑己±在城市环线中行驶的两个己± 站之间的距离是2公里到5公里之间。 And, between 2 km to consider the distance between five kilometers in urban driving ± hexyl ring has two stations ± Yes. 为了完成上述要求，电力或混合动力己±，通常地，将需要持续至少200公里的城市使用的电池。 To accomplish the above claims, electric or hybrid ± hexyl, generally, it will be required for at least 200 kilometers in urban use of the battery. 因此，电力/混合己±需要200千瓦时范围内的大的电池组，运会显著增加运行成本。 Thus, the power / mixed hexyl ± requires a large battery pack within the range of 200 kWh, significantly increases transportation costs operation. [000引另外，使用单个马达来驱动己±需要大尺寸的马达和沉重的重量。 [000 cited Further, using a single motor to drive the motor and has a heavy weight ± requires a large size. 此外，对于一个重型单个马达，较高的惯性会引起响应滞后。 Further, a single motor for a heavy-duty, high inertia will cause a response delay. 甚至一个单独的大马达不能够优化电池消耗。 Even a single large motor is not possible to optimize battery consumption. 此外，需要采用多级齿轮箱达到更高的速度。 In addition, multi-stage gearboxes need to achieve higher speeds. 因此，需要一种具有一个或多个马达的系统，用于将汽车转换成混合电动车和/或电动车。  Accordingly, a need for a system having one or more motors, for converting into automotive hybrid electric vehicle and / or an electric vehicle. 本发明的系统，具有多个马达W能优化电池消耗，通过根据推动汽车所需要的力矩来运转一个或多个马达。 The system of the present invention, a motor having a plurality of battery consumption W can be optimized, by the operation according to the torque required to propel the vehicle or a plurality of motors. 本发明的一个实施例描述了用来将汽车转换为混合电动汽车和电动汽车的改装系统。  An embodiment of the present invention is described for converting vehicles as electric vehicles and hybrid electric vehicles retrofit system. 带有本发明的系统，现有的车能够转换为一个轻度混合的、一个完全混合的、一个纯粹的电动汽车，具有更高容量马达的电动车和重型电动车。 System, the conventional vehicle with the present invention can be converted into a mild hybrid, a complete mixing of a pure electric vehicle, an electric motor having a higher capacity electric vehicles and heavy vehicles. 因此，利用本发明的系统，现有的车辆可W被转换成不同的范围的混合动力和电动车，根据需要，对现有车辆组件没有太多修改。 Thus, using the system according to the present invention, a conventional vehicle W may be converted to a different range of hybrid and electric vehicles, according to need, without much modification to an existing vehicle component. 该系统包括一个电源化PS)，其包括一个或多个马达W向车辆提供故障保护扭矩和电线束制动能用于充电一个或多个电池，一个或多个可连接的电力齿轮组件化PGA)，配置为禪合一个或多个马达至传动轴W用于向车辆提供扭矩，和禪合至电源化PS)的电子控制单元W用于动态控制基于运行条件的一个或多个马达的运行来驱动车辆。 The system comprises a power supply of PS), which comprises one or more motors W provides failsafe braking torque and the wire harness to the vehicle can be used to charge one or more batteries, one or more of the gear assembly connected to a power PGA ), configured as one or more co-Zen motors to the propeller shaft for providing a torque to the vehicle W, and laminated to the power of Zen PS) W electronic control unit for dynamically controlling the operation based on one or more operating conditions of the motors to drive the vehicle. 在一个实施例中，一个或多个连接的电力齿轮组件化PGA)被配置为将在垂直位置和平行位置中的至少一个位置的一个或多个电源与传动轴连接。  In one embodiment, the one or more electrical connector assembly of the gear PGA) is configured to at least one position in a vertical and parallel position or a plurality of power transmission shaft is connected. 电子控制单元化CU)被配置成控制和提供能源给车辆子系统，车辆子系统包括但不限于，空调系统、真空制动系统和空气制动系统。 Of the electronic control unit CU) is configured to control and provide energy to the vehicle subsystem, the vehicle subsystem includes but is not limited to, air conditioning systems, braking systems and vacuum air brake system. 一个或多个传感器包括但不限于，油口传感器、制动传感器、和转速传感器， 用于提供一个或多个信号至所述电子控制单元化CU)。 One or more sensors include, but are not limited to, port sensor, a brake sensor, speed sensor and for providing one or more signals to the electronic control unit of CU). 发动机控制系统(EMS)通过取得油口输入来控制车辆发动机，油口输入包括但不限于，车辆速度、排气、发动机溫度和加速度。 The engine control system (EMS) to control the vehicle engine is achieved through the input port, the input port include but are not limited to, vehicle speed, exhaust temperature and engine acceleration. 全球移动系统(GSM)通信发送车辆相关的信息至网络服务器，从而使网络服务器能监视车辆的工作状态和车辆的位置。 The position of the vehicle and the operating state of the Global System for Mobile (GSM) communication sending vehicle-related information to a network server, the network server so that the vehicle can be monitored. 由电子控制单元控制的一个或多个马达控制器，提供逻辑来确定运行哪些马达及提取多少的功率W提供在车辆的每一个操作点所需要的扭矩。 One or more motor controllers controlled by the electronic control unit, which provides the logic operation to determine how much power W of the motor and provide the extracted torque at each point of the vehicle operation required. 本发明的另一个实施例描述了一种混合电动车。 Another  embodiment of the present invention describes a hybrid electric vehicle. 所述车包括两个或更多轮子用于通过传动轴接受到的扭矩来推动车辆，一个电源化PS)包括一个或多个马达W向车辆提供故障保护扭矩和电线束制动能用于充电一个或多个电池，一个或多个可连接的电力齿轮组件化PGA)被配置为禪合一个或多个马达至传动轴W用于向车辆提供扭矩，被禪合至电源化PS)的电子控制单元W用于动态控制基于运行条件的一个或多个马达的运行来驱动车辆，W及一个或多个电池用于向电源化PS)和一个或多个与车配套的电气设备提供电能，当电源化PS)作为发电机运行时所述一个或多个电池被充电，其中一个或多个连接的电力齿轮组件被配置为将在垂直位置和平行位置中的至少一个位置上的一个或多个电源连接至传动轴。 The vehicle comprises two or more wheels received through the shaft for the torque to propel the vehicle, a power of PS) comprises one or more torque motors W and provide fault protection to the wire bundle can be used for charging a vehicle brake one or more batteries, one or more of the gear assembly connected to a power PGA) is configured as one or more co-Zen motors to the propeller shaft for providing a torque to the vehicle W, is bonded to the power of Zen PS) electronic W control unit for dynamically controlling to drive the vehicle, W, and one or more batteries for supplying power to the power source of PS), and one or more ancillary electrical equipment based on the vehicle running one or more operating conditions of the motor, when the power of the PS) as a generator when the one or more batteries to be charged, wherein the one or more power gear assembly is configured to connect at least one of a position and a vertical position or a parallel position power supply is connected to the drive shaft. 本发明的另一实施例描述了电动车。 Another  embodiment of the present invention described electric vehicles. 所述电动车包括两个或更多轮子用于通过传动轴接受到的扭矩来推动车辆，一个电源化PS)包括一个或多个马达W向车辆提供故障保护扭矩和电线束制动能用于给一个或多个电池充电，一个或多个可连接的电力齿轮组件化PGA)被配置为禪合一个或多个马达至传动轴W用于向车辆提供扭矩，被禪合至电源化PS)的电子控制单元W用于动态控制基于运行条件的一个或多个马达的运行来驱动车辆，及一个或多个电池用于向电源巧PS)和一个或多个与车配套的电气设备提供电能，当电源化PS)作为发电机运行时所述一个或多个电池被充电，其中一个或多个连接的电力齿轮组件化PGA)被配置为将在垂直位置和平行位置中的至少一个位置上的一个或多个电源连接至传动轴。 The electric vehicle comprises two or more wheels received through the shaft for the torque to propel the vehicle, a power of PS) comprises one or more motors W provides failsafe braking torque and the wire harness to the vehicle can be used to one or more batteries, one or more of the gear assembly connected to a power PGA) is configured as one or more co-Zen power of the motor to the propeller shaft PS for providing torque to the vehicle W, it is bonded to Zen) W electronic control unit for dynamically controlling the operation of one or more operating conditions based on the motor to drive the vehicle, and one or more batteries for supplying power to the power source clever PS) and one or more ancillary electrical equipment to the vehicle , when the power of the PS) as a generator when the one or more batteries to be charged, wherein the one or more electrical connector assembly of the gear PGA) is configured to position at least a vertical position and parallel to the upper position one or more power sources coupled to the drive shaft. 图1表示根据本发明一个的实施例示出的将车转换为混合电动车或电动车巧V)的改装系统的方框图。  FIG. 1 shows a block diagram showing the car is converted to an electric vehicle or a hybrid electric vehicle clever V) of the modified system according to one embodiment of the present invention. 图2表示根据本发明的一个实施例示出的用于不同配置的系统结构。  FIG 2 illustrates a system configuration for different configurations, according to one embodiment of the present invention. 图3表示根据本发明的实施例的电力齿轮组件化PGA)的图形表示。  FIG. 3 shows a power gear assembly showing PGA embodiment of the present invention embodiment) pattern. [00Π ]图4表示根据本发明的另一实施例的电力齿轮组件化PGA)与车辆底盘集成的图形表不。 [00Π] Figure 4 shows another embodiment of the invention, a power gear assembly embodiment PGA) integrated with a graphical representation of the vehicle chassis is not. 图5表示根据本发明的实施例的电力齿轮组件化PGA)的套管和配件的图形表示。  FIG. 5 shows a power gear assembly showing PGA embodiment of the present invention) and fitting the sleeve pattern. 图6表示根据本发明的实施例的电力齿轮组件化PGA)的配置。  FIG. 6 shows a configuration of the power gear assembly of the embodiment of the present embodiment PGA invention). 图7表示根据本发明另一实施例的电力齿轮组件化PGA)的配置。  FIG. 7 shows the power of the gear assembly PGA) according to another embodiment of the present invention is arranged. 图8表示本发明的又一实施例的电力齿轮组件化PGA)的配置。  FIG. 8 shows a further assembly according to the present invention, a power gear embodiment of PGA) configuration. 图9表示根据本发明的另一个实施例的电力齿轮组件化PGA)的配置。  FIG. 9 shows a configuration of the power of the gear assembly PGA) according to another embodiment of the present invention. 图10表示根据本发明的另一个实施例的电力齿轮组件化PGA)的配置。  FIG. 10 shows the configuration of the power gear assembly PGA) according to another embodiment of the present invention. 图11表示根据本发明的另一个实施例的电力齿轮组件化PGA)的配置。  FIG. 11 shows the power of the gear assembly PGA) according to another embodiment of the present invention configured in accordance with embodiments. [002引图12表示根据本发明的另一个实施例的电力齿轮组件化PGA)的配置。 [002 represents a configuration of a power lead 12 of the gear assembly PGA) according to another embodiment of the present invention. 现在将本发明的实施例参考附图详细描述。  Embodiments of the invention will now be described in detail with reference to the accompanying drawings. 然而，本发明并不限定于运些实施方式。 However, the present invention is not limited to these embodiments transported. 本发明的装置的各种元件的大小、形状、位置、数量和组成仅仅是示例性并且本领域技术人员在不脱离本发明的范围内可w作出各种修改。 The size of the various elements of the device according to the present invention, the shape, position, number, and composition are merely exemplary and those skilled in the art without departing from the scope of the invention various modifications may be w. 因此，本发明的实施例仅仅用来向本发明的技术领域中的普通技术人员更清楚地解释本发明。 Thus, embodiments of the present invention is merely used to more clearly explain the present invention Field of the invention one of ordinary skill in the art. 在附图中，相同的标号用于表示相同的部件。 In the drawings, like numbers refer to like parts. 本说明书在多个位置会提及"一"、"一个"或"一些"实施例（复数）。  In the present specification will refer to a plurality of positions "a", "an" or "some" embodiment (s). 运并不一定意味着每个运样的引用都是相同的实施例（多个），或者该功能仅用于单个实施例。 Operation does not necessarily mean that each reference is to the same embodiment (s) of the sample transport, or which function only for a single embodiment. 不同实施例的单个特征也可W结合从而提供出其它的实施例。 Single features of different embodiments may also be combined to provide a W other embodiments. 如本文所使用，单数形式"一"、"一个"和"该"也旨在包括复数形式，除非明确说明。  As used herein, the singular forms "a", "an" and "the" are intended to include the plural forms as well, unless expressly stated otherwise. 应当进一步理解的，术语"包括"、"包含"、"包括"和/或"包含"用于本说明书中时，指明所述的特征、整体、步骤、操作、元件和/或组件的存在，但不排除存在或附加一个或多个其它特征整体、步骤、操作、元件、组件和/或它们的群组。 It will be further understood that the terms "comprising", "including", "comprising" and / or "comprising," when used in this specification, specify the presence of stated features, integers, steps, operations, elements, and / or components, but do not preclude the presence or addition of one or more other features integers, steps, operations, elements, components, and / or groups thereof. 应该理解的是，当元件被提及"连接" 或"禪合"到另一元件时，它可W直接连接或禪合到另一元件或者可W存在中间元件。 It should be understood that when an element is referred to "connected" or "Zen bonded" to another element, it can be directly connected or W Chan bonded to the other element or intervening elements may be W. 此外， 如本文中所用的"连接"或"禪合"可包括可操作地连接或禪合。 Further, as used herein, "connected" or "co-Zen" may include operably linked or bonded Zen. 如本文所用的，术语"和/或" 包括一个或多个相关的列出项的任何和所有组合和设置。 As used herein, the term "and / or" includes one or more of the associated listed items and any and all combinations of settings. 除非另有定义，本文中使用的所有术语(包括技术和科学术语)具有如本领域的普通技术人员所通常理解的本公开内容所设及的相同的含义。  Unless otherwise defined, all terms (including technical and scientific terms) used herein have the same meaning as in the present disclosure, those of ordinary skill in the art as commonly understood and established the. 进一步理解，术语，诸如在常用词典中定义，应该解释为具有的定义是在相关领域的内容中的它们的含义是一致的，并且不会理想化或过于正式的意义，除非在本文中明确地解释。 Further understood that terms, such as those defined in commonly used dictionaries, should be interpreted as having the definition of the relevant content in areas of their meaning is the same, and not idealized or overly formal sense unless expressly herein to Explanation. 本发明描述了一种用于将车转换为混合动力车或电力车的系统。  The present invention describes a system for converting a hybrid vehicle or electric vehicle. 该系统包括多个电源而非单个大容量电源W优化能源消耗及电线束制动能。 The system includes a plurality of power rather than a single large-capacity power consumption and optimize energy W wire bundle braking energy. 此外，该系统具有能结合高可用性的故障安全功能，即由于多台马达，一台马达出现故障将不会妨碍整个系统。 In addition, the system has a fail-safe function capable of binding high availability, i.e., since the plurality of motors, a motor failure will not prevent the entire system. 该系统还提供了更好的散热效果而无需强制冷却，更好的启动扭矩，和更快的响应而一个大的单个马达由于惯性滞后而具有较慢的响应，运与没有运一限制的小的多个马达截然相反。 The system also provides better cooling effect without forced cooling, a better starting torque, and faster response and a large inertia lag of a single motor having a slow response, and operational limits is not running a small multiple motor opposite. 根据车辆在任何给定时间点的确切扭矩要求，马达的合适数量将由系统的控制逻辑来执行。 Depending on the exact vehicle torque demand at any given point in time, by the system control logic suitable number of the motor is performed. 运将确保该电动机总是在其最佳效率区运转。 Shipping will ensure that the motor is always running at its optimum efficiency region. 此外，该系统能够远程监控、诊断和远程控制。 In addition, the system is capable of remote monitoring, diagnostics and remote control. 图1根据本发明的一个实施例，示出将车配置为混合电动车的改装系统100的框图。  FIG. 1 in accordance with one embodiment of the present invention, a block diagram illustrating the configuration of the car hybrid electric vehicle 100 of the modified system. 该系统100包括电源化PS) 101、一个或多个电力齿轮组件化PGA)(图1中未表示）、电子控制单元102、和电池组103。 The system includes a power supply 100 of PS) 101, one or more power components of the PGA gear) (not shown in FIG. 1), the electronic control unit 102, and the battery pack 103. 电源化PSH01包括一个或多个马达101A-101NW提供故障安全扭矩给车辆和电线束制动能对一个或多个电池进行充电。 PSH01 of power comprises a plurality of motors 101A-101NW or provide torque to the vehicle and a fail-safe brake wire bundles can be one or more batteries for charging. 一个或多个电力齿轮组件巧PGA)具有可连接的设计用于禪合一个或多个马达到至少一个用于提供扭矩给车辆的传动轴。 Designing one or more gear assemblies clever power PGA) having a connection for Zen bonded to at least one or more motors used to provide torque to the vehicle drive shaft. 电子控制单元102被禪合到电源化PS) 101。 The electronic control unit 102 is bonded to the power of Zen PS) 101. 电子控制单元化CU)包括控制逻辑，动态地控制基于扭矩需求和运行条件的一个或多个马达的运行来驱动车。 Of the electronic control unit CU) includes control logic to dynamically control the operation of one or more motor torque demand and operating conditions of the vehicle based on driving. 电池组103包括一个或多个电池并且可W用于W化学能的形式存储电能。 The battery pack 103 includes one or more batteries and can be used for W W chemical energy stored as electric energy. 电池组103从直接的交流(AC)电源充电。 Battery pack 103 (AC) power charged from direct communication. 在示范性实施例中，电池组103使用突发集电弓式充电器充电。 Embodiment, the battery pack 103 using burst pantograph charger in an exemplary embodiment. 在另一示范性实施例中，电池组102在停车区域中的充电哨站进行充电。 Embodiment, the battery pack 102 is charged in a parking area outpost charging In another exemplary embodiment. 电源化PSH01可W包括在本领域中已知的任何类型的合适的马达，但优选多相马达。 W may include a supply of PSH01 known in the art suitable motor of any type, but is preferably multi-phase motor. 电池组103提供电能到马达控制器104用于驱动一个或多个马达101A-101N。  The battery 103 provides electrical power to the motor controller 104 for driving one or more motors 101A-101N. 马达控制器104的控制逻辑控制多个马达101A-101N的功能。 The control logic controls the motor controller 104 features a plurality of motors 101A-101N. 在一些实施例中，马达控制器104基于驱动车辆所需的扭矩和功率的量来开动一个或多个马达101A-101N。 In some embodiments, the motor controller 104 based on the amount of torque and power required to drive the vehicle to actuate one or more motors 101A-101N. 例如，马达控制器104开动所有的马达来将车从静止位置移动，并随后根据扭矩和功率的要求将101A-101N中的一个或多个马达切断。 For example, the motor controller 104 to actuate the motor car all moved from the rest position, and then according to the torque and power requirements will 101A-101N to one or more motors cutting. 因此，马达101 A-IOIN提供功率给车轮来运行混合动力/电动车。 Thus, the motor 101 A-IOIN providing power to the wheels to run a hybrid / electric vehicle. 马达101A-101N可W通过齿轮或联轴器、或本领域中已知的任何其它方法连接到车轮上。 W may be a motor 101A-101N via a gear or coupling, or any other method known in the art is connected to the wheel. 可W注意到的是，在车中使用的马达101A-101N的数量可W依赖于最大负载、车辆的类型、地形和车辆使用时所需要的扭矩和功率来确定。 W may be noted that the number of motors 101A-101N used in the vehicle W may be dependent on the maximum load, when the type of the vehicle, the terrain and the vehicle using the power and torque required to be determined. 此外，多个马达101A-101N有助于获得较快的功率响应，由于每个马达的低惯性。 Further, a plurality of motors 101A-101N help achieve fast power response, due to the low inertia of each motor. 此外，马达中的一个的故障不会影响车的运行。 In addition, the failure of one of the motors will not affect the operation of vehicles. 图2表示了根据本发明实施例的不同配置的系统的结构。  FIG. 2 shows a different configuration of the system configuration of an embodiment of the present invention. 混合动力电动车或电动车包括改装系统100。 Hybrid electric vehicle or an electric vehicle 100 includes a modified system. 该车包括两对车轮、用于提供扭矩给两对车轮的轴201、用于通过轴201给两对车轮提供扭矩的发动机、利用一个或多个电力齿轮组件巧PGA)202禪合至传动轴201的一个或多个马达203、电子控制单元204、发动机管理系统化MS)205、一个或多个3相AC 马达控制器206、和电池组207。 The car comprises two pairs of wheels, torque to shaft 201 for providing two pairs of wheels for the shaft 201 to provide torque to the two pairs of wheels by the engine, using one or more power gear assembly Qiao PGA) 202 bonded to the propeller shaft Zen one or more motors 201, 203, the electronic control unit 204, the systematic management engine MS) 205, one or more three-phase AC motor controller 206, and the battery pack 207. 发动机管理系统化MS)通过取得油口输入来控制发动机，油口输入来自所有取决于用户需求的传动器、速度、排气、发动机溫度、加速度、和其它参数。  Systematic management engine MS) is controlled by obtaining the engine input port, the input port depending on the needs of users from all actuators, speed, exhaust gas, engine temperature, acceleration, and other parameters. 从运一油口输入，EMS 计算所需功率的量并控制向发动机供给燃料来提供所需的功率。 Transported from one input port, EMS calculates the amount of power required to provide the desired control and power supply of fuel to the engine. 电子控制单元化CU)204连接到发动机管理系统化MS)205用于提供与预定义的配置一致的一个或多个指令。  The electronic control unit of CU) 204 connected to the systematic management engine MS) 205 configured for one or more instructions to provide consistent and predefined. 该车辆还包括电池管理系统(BMS)，它可W内置在电子控制单元中或者可W配置在电子控制单元化CU)204的外部，并且由电子控制单元化CU)204控制。 The vehicle further includes a battery management system (the BMS), which can be built in the electronic control unit W, or W may be disposed outside of the electronic control unit CU) 204, and a unit controlled by an electronic CU) 204 controls. 电池管理系统监视每一个电池的电池电压、电流和溫度。 The battery management system monitors the battery voltage, current and temperature of each battery. 3相AC马达控制器206配置为驱动一个或多个马达并由电子控制单元化CU)204控制。  3-phase AC motor controller 206 is configured to drive one or more motors by the electronic control unit of CU) 204 control. ECU 204的马达控制器206的控制逻辑提供指令给一个或多个马达用于在一个或多个操作点根据预定义的参数和预定的指令来提供扭矩。 ECU 204 controls motor controller logic 206 provides instructions to the one or more motors or for a plurality of operating points to provide a predetermined torque based on the parameters and predefined command. 该车辆还包括车辆辅助设备208、一个或多个传感器209、保护和控制开关齿轮单元210、车辆电池211、DC-DC充电器212、快速充电单元214、控制器区域网络(CAN)、全球移动通信系统(GSM)。  The vehicle 208 further comprises one or more sensors of the vehicle auxiliary device 209, protective gear unit 210 and a control switch, a vehicle battery 211, DC-DC charger 212, fast charging unit 214, a controller area network (CAN) , global system for mobile communications (GSM). 所述传感器包括但不限于，油口传感器、制动传感器、和转速传感器。 The sensors include, but are not limited to, port sensor, a brake sensor, and a speed sensor. 所述车辆辅助设备208包括一个或多个电源（电池)消耗系统，如空调系统、真空或空气制动系统。  The vehicle 208 includes a secondary device or a plurality of power (battery) consumption system, air conditioning system, a vacuum or air brake system. 现在，当车辆在EV模式下运行时，运些元件将需要控制和功率。 Now, when the vehicle runs in the EV mode, these elements would need to transport control and power. 所述ECU包括所需的控制逻辑来根据车辆运行状况运行运些设备W及提供动力和根据需要进行控制。 The ECU comprises a control logic required to operate these devices transport W The operating conditions of the vehicle and provide power and control required. 保护和控制开关齿轮单元210提供保护防止可能会损坏系统的任何短路、过电流和过电压。  Protection and control the switching gear unit 210 provides protection to prevent any short circuit could damage the system, the overcurrent and overvoltage. 此外，车辆可W有一个或多个更小的容量的电池211来运行该车辆电气负载，例如但不限于，雨刷、照明灯、卿趴、音乐系统。  Further, the vehicle W may have one or more smaller capacity battery 211 to run the vehicle electrical loads such as, but not limited to, wipers, lights, lying Qing, music system. 所述DC-DC充电器212通过从电池组的电压转换到车辆电池所需要的电压来给车辆电池211充电。 The DC-DC charger 212 to charge the vehicle battery 211 by converting the voltage of the battery to the vehicle battery voltage required. 在増程器或EV车配置中，较大的电池组需要被用于驱动车辆并且运将会在外部通过一个快速充电站进行充电。  In zo drive vehicle configuration or EV, a battery pack needs to be larger for driving the vehicle and will be transported externally charged by a rapid charging station. 运是在车辆外侧由虚线所示。 Operation is shown by a dashed line on the outside of the vehicle. 每当车辆得到机会停下来，它可W在不到15分钟的时间内快速的为电池充电。 Whenever given the opportunity to stop the vehicle, it can be quickly charge the battery W in less than 15 minutes. 控制器区域网络(CAN)配置在车辆中使微控制器和其它通信设备在车辆内相互通信。  Controller Area Network (CAN) arranged in the vehicle communicate with each other manipulation microcontroller and other communication devices in the vehicle. GSM是一个远程信息装置，用于从ECU向网络服务器传送信息W监测该车辆的状况和位置。 GSM is a remote information means for transmitting information W monitoring condition and location of the vehicle to the network server from the ECU. 它有一个诊断算法，可预先确定车辆的潜在故障和车辆故障。 It has a diagnostic algorithm, can be predetermined potential failure and vehicle breakdowns of the vehicle. 图3表示根据本发明的实施例的电力齿轮组件化PGA)的图形表示。  FIG. 3 shows a power gear assembly showing PGA embodiment of the present invention embodiment) pattern. 图3表示两个马达通过齿轮组件连接到所述轴。 Figure 3 shows two motors connected to the shaft by a gear assembly. 每个马达具有一个连接到冠的小齿轮，其安装在该轴上。 Each motor has a pinion connected to the crown, which is mounted on the shaft. 具有运种布置，马达的功率垂直传送。 Vertical power transmission arrangement has a carrying species, motor. [004引图4表示根据本发明的另一实施例的电力齿轮组件化PGA)与车辆底盘集成的图形表示。 [004 Figure 4 shows the power lead of the gear assembly of embodiment PGA) integrated with the chassis of the vehicle according to another graphical representation of the present invention. 图4表示传动轴的Ξ段，前段401连接到发动机(获取发动机振动），中段402连接到底盘W及后段403连接到差速器(获取道路振动）"EPGA连接到轴的中段，由于它连接到底盘所W它是最稳定的轴。鉴于此，传动轴的中屯、部分的长度是确定可在车辆中级联的EPGA的数量的控制点。 Ξ Figure 4 shows the drive shaft section, front section 401 is connected to an engine (engine vibration acquisition), connected to the middle in the end plate 402 and the W-stage 403 is connected to a differential (acquired road vibration) "EPGA connected to the middle of the shaft, as it in the end plate connected to the W-axis which is the most stable. in view of this, the length of the shaft Tun, is to determine the portion in the vehicle can be cascaded EPGA the number of control points. 在本发明的一个实施例中，为了增大具有较短长度的轴的功率，所述的EPS的长度或直径可W增加W获得更大的功率出于相同的EPGA套管设计。  In one embodiment of the present invention, in order to increase the power shaft having a shorter length, the length or diameter of EPS may increase W W more power for the same EPGA casing design. 图5表示根据本发明的实施例示出的电力齿轮组件化PGA)的套管和配件的图形表示。  FIG. 5 shows an embodiment according to the present invention, showing the gear assembly illustrated power of the PGA), and fittings of the sleeve pattern. 在该图中，不同长度的两个马达连接于EPGA(如图3和4中所公开)W获取可变量的功率。 In the drawing, two motors connected to EPGA different lengths (3 and 4 in FIG disclosed) W acquired power may be variable. 1.不同的两极-例如  1. Different poles - e.g. 所有马达连接到使用EPGA的车，可W用于特殊的驾驶需求，例如，睹爬坡、紧急制动、突然加速、超车等而不换高档齿轮。  The motor is connected to all of the vehicles used EPGA, W can be used for special driving needs, for example, see ramp, emergency braking, sudden acceleration, overtaking without upshifting the gear. 2.根据马达的运转速度决定不同的额定功率。  2. Decides different power ratings depending on the operating speed of the motor. 例如，低的额定功率用于低速高扭矩马达，反之亦然。 For example, low rated power for low speed high torque motor, and vice versa. 3.根据运算占空比来决定EPS的不同尺寸。  3. The EPS different sizes determined according to the duty ratio calculation. 例如在城市环境下，由于高占空比导致EPS将趋向升溫，因此EI^的该马达的降额将必须更高。 For example, in urban environment, due to high duty cycle will tend to cause EPS raised, so the derating EI ^ motor will have to be higher. [005引例如，如果在车轮所需的扭矩是20000牛顿米，具有峰值扭矩因子2的2个EPS,具有6的差动比、EPGA比为5,那么采用上述公式，一个ESP所需要的额定扭矩是167牛顿米。 [005 cited example, if the required wheel torque in Newton-meters is 20,000, with a peak torque factor of 2 EPS 2, having a differential than 6, EPGA ratio of 5, then the above equation, a nominal desired ESP torque is 167 Nm. 本发明的EPGA的配置是一个完整的模块化配置。  EPGA the configuration of the present invention is a complete modular configuration. 由于运种模块化设计，有可能通过各种安排将多个电源连接在一起。 The arrival of kinds of modular design, it is possible to be connected together by a plurality of various power supply arrangements. 其中的一些安排在下面详细讨论。 Some of these arrangements are discussed in detail below. 在EPGA中，垂直于传动轴的所有EPS相连接，通过在差速器中较常使用的准双曲面异形冠和小齿轮装置。 In EPGA, all EPS perpendicular to the drive shaft is connected to the hypoid more commonly used in the differential crown and the pinion are shaped by means. 然而， 有可能使用任何类型的齿轮，其可W垂直地发射功率，代替准双曲面异形冠和小齿轮，如简单的锥齿轮。 However, it is possible to use any type of gear, which can transmit power W vertically, instead of a hypoid pinion and crown shaped, such as a simple bevel gears. 但应该指出的是，下面提及的EPGA配置仅仅是说明性的而且根据车辆要求的多种配置的组合都是可能的。 It should be noted that, EPGA below-mentioned configuration is merely illustrative of various configurations and compositions according to the requirements of the vehicle are possible. 例如，任何数目的马达可W使用的，可被安排在配置的任何组合中，所有在垂直、所有在并行、平行和垂直排列的任何组合、W及W上的任何组合。 For example, any number of motors may be used in W, it can be arranged in any combination of configurations, all of the vertical, all on a parallel combination of any, any combination of parallel and vertically aligned, W, and W is. 此外， 任何长度和功率的马达，W及其中任意组合的多个马达，也可W按要求使用。 In addition, any length and power of the motor, W, and combinations of any of the plurality of motors, W may be used as required. 图6-12示出了在不同的平面图中的电力齿轮组件化PGA)和用不同数量的电源化PS)组装的各种配置。  Figures 6-12 illustrate various components of the power gear in plan view in PGA), and with a variety of different numbers of power supply PS) assembled configuration. 图6根据本发明的实施例示出了电力齿轮组件化PGA)的配置。  FIG. 6 illustrates an embodiment of the present invention, a gear assembly of the power PGA) configuration. 在本实施例中，两个电源化PS)通过具有双曲面异形冠和小齿轮装置的EPGA垂直于传动轴连接，双曲面异形冠和小齿轮装置常用于差速器中。 In the present embodiment, the power of two PS) are connected by the drive shaft having a vertical EPGA hyperboloid shaped crown and pinion means, hyperboloid shaped crown and pinion arrangement used in the differentials. ~图7根据本发明的实施例示出了电力齿轮组件化PGA)的配置。 To 7 according to embodiments of the present invention shows a gear assembly of the power PGA) configuration. 在本实施例中，4个I EPS通过具有双曲面异形冠和小齿轮装置的EPGA垂直于传动轴连接，双曲面异形冠和小齿轮装置常用于差速器中。 In the present embodiment, four I EPS via the drive shaft having a vertical EPGA hyperboloid shaped crown and pinion means, hyperboloid shaped crown and pinion arrangement used in the differentials. 考虑其具有通过万向节连接3根传动轴的布置。  Consider having disposed shaft 3 is connected via a universal joint. 现在，为了适应运样的安排，传动轴中屯、被切割W适应2个EPFA。 Now, in order to adapt the sample transport arrangement, the transmission shafts Tun, accommodate two W is cut EPFA. 运种较高容量系统适合于完全混合电动车(完全肥V)。 Species higher capacity transport system is adapted to complete a hybrid electric vehicle (full fat V). 图8根据本发明的实施例示出了电力齿轮组件化PGA)的配置。  FIG. 8 according to embodiments of the present invention shows a gear assembly of the power PGA) configuration. 在本实施方式中，2 个EPS通过具有双曲面异形冠和小齿轮装置的EPGA垂直于传动轴连接，双曲面异形冠和小齿轮装置常用于差速器中。 In the present embodiment, the drive shaft 2 via EPS EPGA vertical hyperboloid shaped crown and having a pinion gear means, hyperboloid shaped crown and pinion arrangement used in the differentials. 图8中描述的实施例仅包括一个小齿轮，而在图6中描述的实施例包括两个小齿轮。  FIG 8 depicts an embodiment comprising only one pinion, and the embodiment described in FIG. 6 comprises two pinion gears. 运是通过改造一个小齿轮面W适应来自第二个EPS的轴直接集成来实现。  transported through the transformation of W to adapt to a surface of the pinion shaft from the second direct integration of EPS achieved. 通过花键或法兰结构实现集成。 Achieve integration through a spline or flange structure. 在一个实施例中，一个EPS被分为左和右两部分，并通过在中间的一个单轴连接。  In one embodiment, an EPS is divided into two left and right portions, and by connecting a single axis intermediate. 在中间的轴具有齿轮装置来连接到传动轴上的冠状齿轮。 In the middle of the shaft having a gear device connected to the crown gear on the shaft. 考虑其具有通过万向节连接3根传动轴的布置。  Consider having disposed shaft 3 is connected via a universal joint. 现在，为了适应运样的安排，传动轴中屯、被切割W适应所述EPGA。 Now, in order to adapt the sample transport arrangement, the transmission shafts village, W is cut to adapt to the EPGA. 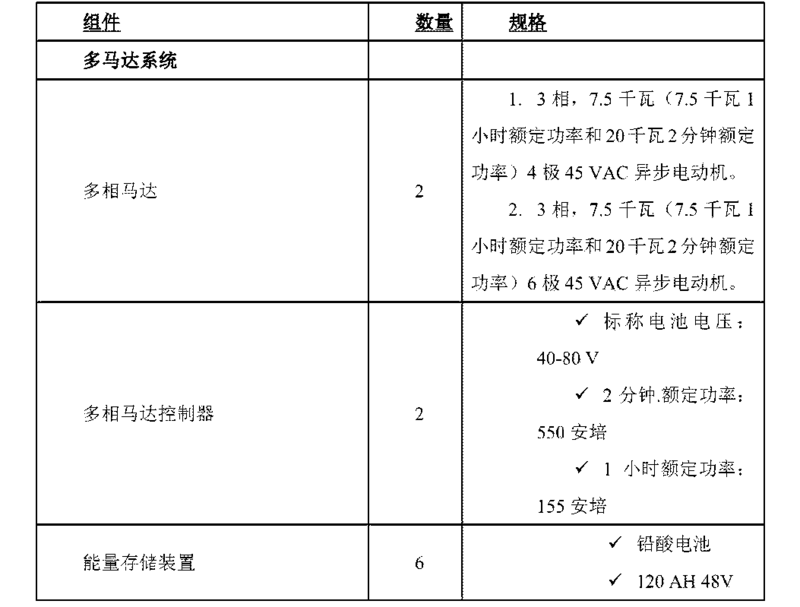 运种较小容量的系统适合于MHEV。 Yun kinds of smaller capacity system suitable for MHEV. 图9根据本发明的实施例示出了电力齿轮组件化PGA)的配置。  FIG. 9 illustrates an embodiment of the present invention a gear assembly of the power PGA) configuration. 在本实施例中，4个EPS连接到传动轴，其中两个是垂直于传动轴，另外两个是平行于传动轴。 In the present embodiment, the EPS is connected to the drive shaft 4, two of which are perpendicular to the drive shaft, the other two parallel to the shaft. 两个EI^通过EPGA 的冠和小齿轮装置连接到传动轴，另外两个EI^平行连接到有很少修改EI^设计的传动轴。 EI ^ two crown is connected to the drive shaft through the pinion gear and EPGA, the other two parallel connected EI ^ with little modification to the design EI ^ shaft. 图10根据本发明的实施例示出了电力齿轮组件化PGA)的配置。  FIG. 10 illustrates an embodiment of the present invention, a gear assembly of the power PGA) configuration. 在本实施中，3个EPS通过万向节连接到所述传动轴，其中两个垂直于传动轴，第Ξ个平行于传动轴。 In the present embodiment, three EPS connected to the drive shaft via a universal joint, which is perpendicular to the two drive shafts, the drive shaft of Ξ parallel. 现在，为了适应运样的安排，一个传动轴的中屯、被切割W适应一个EPS。 Now, in order to adapt the sample transport arrangement, a drive shaft of Tun, accommodate a W is cut EPS. 图9和图10所示的配置是更高容量的系统并且适于完全混合电动车。 Configuration  FIGS. 9 and FIG. 10 is a higher capacity system is adapted to completely and hybrid electric vehicles. 力齿轮组件化PGA)的配置。 Power gear assembly of PGA) configuration. 在本实施例中，6个' EPS通过Ξ个级联的EPGA连接到所述传动轴。 In the present embodiment, 6 'EPS is connected to the drive shaft by Ξ EPGA cascaded. 该EPGA具有双曲面异形冠和小齿轮装置，常在差速器中使用。 The EPGA hyperboloid shaped crown and having a pinion gear, often used in differentials. 考虑其具有通过万向节连接3根传动轴的布置。  Consider having disposed shaft 3 is connected via a universal joint. 现在，为了适应运样的安排，传动轴中屯、被切割W适应3个EPGA。 Now, in order to adapt the sample transport arrangements in Tuen drive shaft, to be cut W accommodate three EPGA. 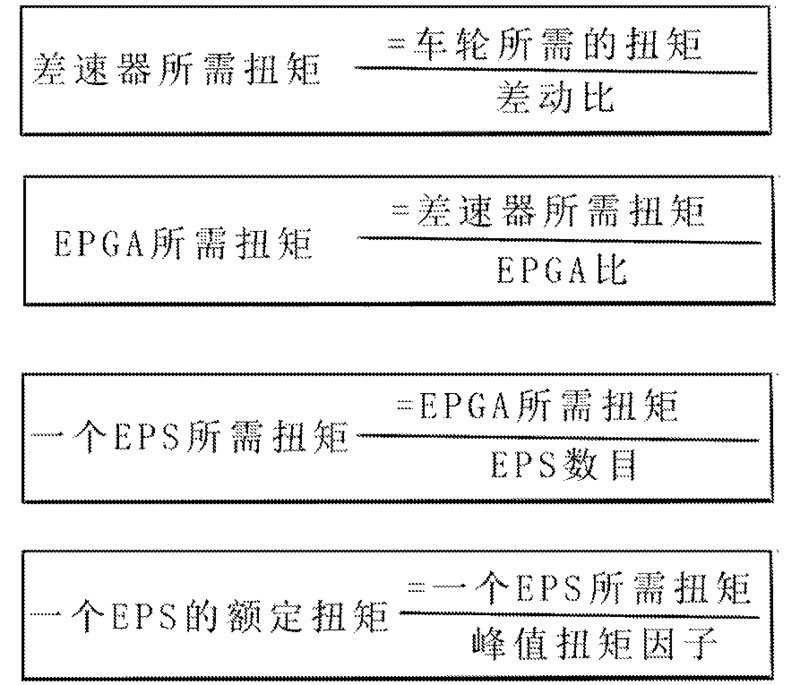 Ξ个EPGA，具有模块化设计，级联在一起。 Ξ a EPGA, has a modular design, cascaded together. 运个极高容量的系统适合于完全混合电动车，它具有较小容量的EPS, W及具有较高的EPS用于倾卸汽车诸如卡车。 A very high capacity of the transport system is adapted to complete the hybrid electric vehicle, which has a smaller capacity of EPS, W, and having a high EPS for automobiles such as trucks dump. 在本实施例中，4个EI^通过一个改造的EPGA平行连接到传动轴。  In the present embodiment, four EI ^ EPGA connected to the drive shaft through a parallel transformation. 运里，上面所讨论的配置的60% W上的部件被保留，而使得EI^安装平行成为可能。 Transport, the member W on the configuration discussed above 60% is retained, so that it becomes possible EI ^ mountable parallel. 在改造后的设计中，刺状或螺旋状的齿轮，适合用于发射功率。  In the design after the transformation, spiny or spiral gear suitable for transmitting power. 运种高容量的系统适用于完全混合电动车或EV。 Kind of high-capacity transport system is suitable for fully electric vehicles or hybrid EV. 该EPGA的模块化设计配置如W上图6-12所示，提供各种系统配置灵活性，如下所述。  The modular design EPGA configuration as shown in Figure 6-12 on W, the flexibility of a variety of system configurations, as described below. 但应注意的是，虽然W述配置中的每一个，从图6到图12,提供混合电动车和电动车的不同范围所需的部件的数目，但是，运些数目仅仅是示例性的。 It should be noted that, while each of said W configuration, FIG. 6 to FIG. 12, the number of parts required to provide a diverse range of electric vehicles and hybrid electric vehicles, but these numbers are only transported exemplary. 例如，一个完整的EV可W被设计，通过仅仅使用两个更大的长度和更高的容量的EPS,而相应地改变其它所需部件的数量。 For example, a complete W EV can be designed by using only two EPS greater length and higher capacity, other correspondingly changed number of components required. 因此，EPS和其它部件的数目可W被布置在不同的组合，W使其适用于现有的车辆需要被转换成混合动力汽车或电动汽车的类型和范围。 Thus, the number of EPS W, and other components may be arranged in different combinations, W type and range of existing vehicles to be converted to a hybrid car or an electric car to make it suitable. 所述系统配置和所述ECU控制逻辑用于不同范围的混合电动车和电动车，根据本发明描述如下。 The  ECU system configuration and the control logic for a different range of electric vehicles and hybrid electric vehicles, according to the present invention is described as follows. 根据一个实施例，所述插电式混合电动车(P皿V)包括多个EPS、多个EPGA、一个电池组、电子控制单元和带有一个或多个的反相器和/或充电器的多相控制器。  According to one embodiment, the plug-in hybrid electric vehicles (P dish V) comprises a plurality of EPS, a plurality EPGA, a battery pack and an electronic control unit with one or more inverters and / or multi-phase controller charger. 车辆可W运行到中档速度如在电动车化V)模式的40公里每小时，超越运个，将作为混合动力车运转。 W vehicle can run to mid-range speeds, such as 40 km of electric vehicle V) mode per hour, overtaking transport one, will operate as a hybrid. 下面的表1示出了各种示例性组件和该配置中各自的需求数量。  The following Table 1 shows the number of various exemplary components and configuration of the respective requirements. 在一个实施例中，车辆操作被划分成在不同的类别中达到一定的速度，如发动(0 至20公里每小时）、加速、巡航、减速、动力和制动。  In one embodiment, the operation is divided into a vehicle reaches a certain speed in different categories, such as engine (0-20 km / h), acceleration, cruise, deceleration, and braking power. 例如，在满载或过载的条件下从零速启动，所有的马达都可W提供扭矩在发动机处于关闭状态时用W提供完整电发射及零污染。  For example, starting from a zero speed at full load or overload, all motors can provide torque to provide a complete power W when the engine is off and with zero pollution emission W. 随后，马达将被切断W及发动机将根据需要提供功率。 Subsequently, the motor will be shut off and the engine will provide power W needed. 表2根据车辆的状态示出发动机和一个或多个马达的各种指示性操作模式。 Table 2 shows various modes of operation of the engine and indicative of one or more motors according to the state of the vehicle. 能量存储系统的容量在运种配置中不会高，但在减速和制动期间它将每隔一定时间还会补足充电除了环境基准之外。  capacity of the energy storage system is not so high in operation configurations but during deceleration and braking, it will make up at regular intervals in addition to charging the reference environment. 运显著降低当电池容量变小时的解决方案的成本。 Transport significantly reduced when the battery capacity becomes small cost solutions. 它也提高了系统的效率，因为静负载减少。 It also improves the efficiency of the system, because the static load is reduced. 假如能量存储系统不被充电时，车辆可W对发动机操作，所述系统可W通过利用再生制动能量作为轻度混合电动车运转。 If the time is not charged energy storage system, the vehicle engine can operate W, W may be by using the system of regeneration as a mild hybrid electric vehicle operation. 运些模式使马达始终在最大效率区（低于额定转速)运行；因此，提高了整个系统的效率。  These operation mode of the motor is always at the maximum efficiency area (below the rated speed) operation; therefore, improves the overall system efficiency. [010引根据一个实施例，轻度混合电动车（轻度皿V)包括多个EPS、EPGA、一个电池组、电子控制单元和带有一个或多个反相器和/或充电器的多相马达控制器。 [010 cited According to one embodiment, mild hybrid electric vehicles (mild dish V) comprises a plurality of EPS, EPGA, a battery pack, and with an electronic control unit or a plurality of inverters and / or embodiments of the multi-charger phase motor controller. 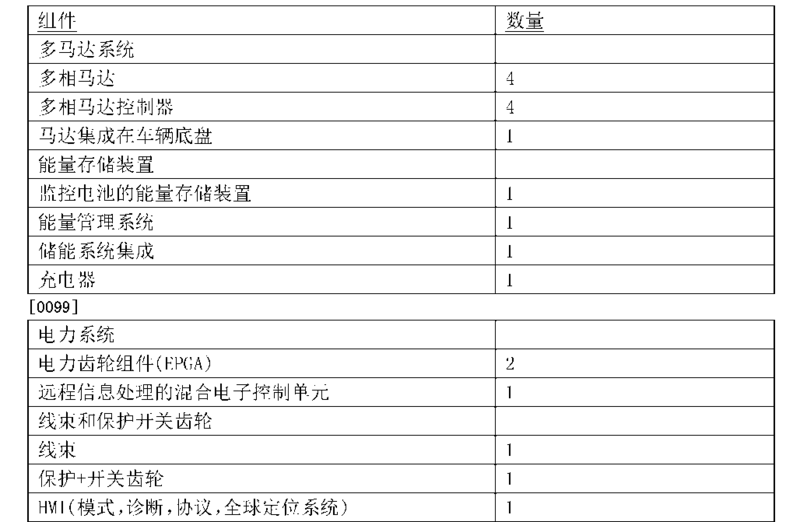 下表3示出了各种示例性组件和该配置中各自的需求数量。  Table 3 shows the number of various exemplary components and configuration of the respective requirements. 现在，与P皿V不同，轻度皿V不具有完整的电启动由于马达的数量减少。  Now, with P different dish V, V mild dish does not have complete electric starter motor is reduced since the number. 车辆操作可W被划分成在不同的类别中达到一定的速度，如发动(0至20公里每小时）、巡航、加速、减速、动力和制动。 W vehicle operation may be divided into up to speed in different categories, such as engine (0-20 km / h), cruising, acceleration, deceleration, and braking power. 表4根据车辆的状态示出发动机和一个或多个马达的各种指示性操作模式。  Table 4 shows the various operating modes indicative of an engine and one or more motors according to the state of the vehicle. 根据一个实施例，完全混合电动车（完全皿V)包括多个EPS、多个EPGA、一个电池组、电子控制单元和带有一个或多个反相器的多相控制器。  According to one embodiment, an entirely embodiment of a hybrid electric vehicle (full dish V) comprises a plurality of EPS, a plurality EPGA, a battery, an electronic control unit, and a controller with one or more multi-phase inverter. 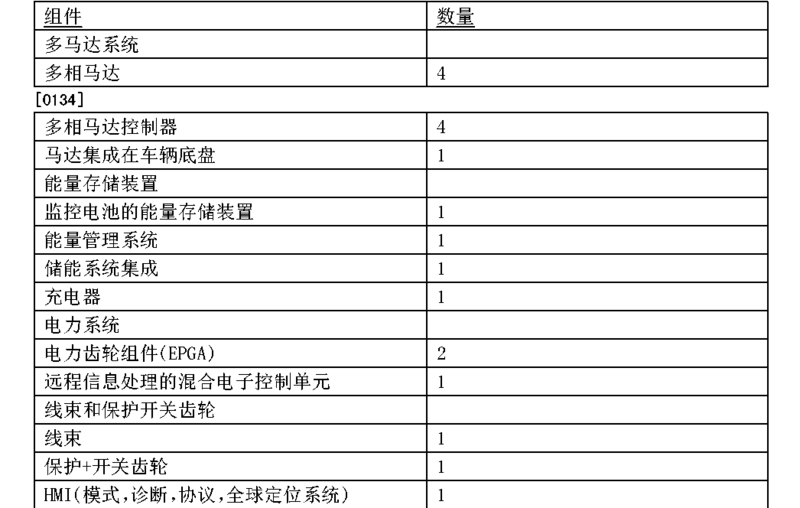 下表5示出了各种示例性组件和该配置中各自的需求数量。  Table 5 shows the number of various exemplary components and configuration of the respective requirements. 完全皿V与P皿V操作一样，但有一点不同在于完全皿V不需要外部充电来充电所述能量存储系统。  V and the dish is completely same operation as V P dish, with one exception that does not require complete dish V external charge to charge the energy storage system. 相反，它使用基于机会的车辆惯性来充电所述能量存储系统。 Instead, it uses the inertia of the vehicle based opportunities to charge the energy storage system. 该系统使用来自一个或多个车辆状态产生的能量用于给电池充电，车辆状态来自制动、减速、下坡和空转。 The system uses the energy from one or more vehicle state generated for charging the battery, the vehicle state from the brake, deceleration, idling, and downhill. 在运种配置中，车辆操作被划分成在不同的类别中达到一定的速度，如发动(0至20公里每小时）、巡航、加速、减速、动力和制动。  In the configurations of the operation, the operation is divided into a vehicle reaches a certain speed in different categories, such as the launch (0 to 20 km / h), cruising, acceleration, deceleration, and braking power. 在从零速启动，所有的马达提供扭矩在发动机处于关闭状态时用W提供完整电发射及零污染。  In the zero speed start emission and zero pollution, all provided complete an electrical motor to provide torque when the engine is turned off by W from. 随后，马达将被切断W及发动机将根据需要而被引入。 Subsequently, the motor will be shut off and the engine W will be introduced as required. 表6根据车辆的状态示出发动机和一个或多个马达的各种指示性操作模式。 Table 6 shows the mode of operation of the engine various instructions and one or more motors according to the state of the vehicle. 运些模式使马达始终在最大效率区(低于额定转速)运行提高整个系统的效率。  These operation mode of the motor is always at the maximum efficiency area (below the rated speed) increase the operating efficiency of the entire system. 本发明的一个实施例描述了电动车化V)包括多个EPS、多个EPGA、一个电池组、电子控制单元和带有一个或多个反相器和/或充电器的多相控制器。  An embodiment of the present invention described embodiments of the electric vehicle V) comprises a plurality of polyphase EPS, a plurality EPGA, a battery pack, and with an electronic control unit or a plurality of inverters and / or a charger controller. 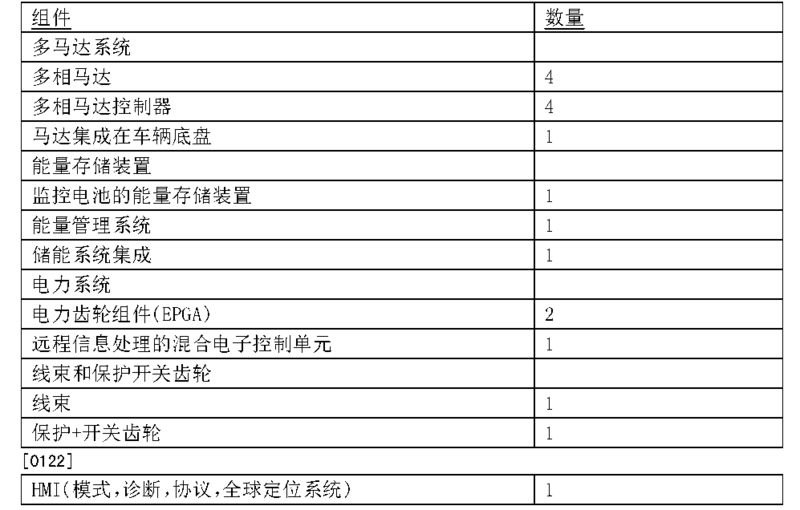 下表7示出了各种示例性组件和该配置中各自的需求数量。  Table 7 shows the number of various exemplary components and configuration of the respective requirements. 车辆在EV模式下可W运行到最高速度。  vehicle in the EV running mode to the maximum speed W. 除此之外，它将会作为一个范围扩展模式运行。 In addition, it will run as a range extender mode. 一辆EV在非故障模式只有电功率可用在车轮而无发动机功率。  an EV electric power only without an engine power available at the wheels in a non-fault mode. 假如使用发动机， 它将会扩展范围超过电能存储容量。 If using the engine, it will expand the range of more than the electrical energy storage capacity. 运里与普通广域电动车的差别在于发动机不仅仅被用于向所述能量存储系统充电，而且还被用于直接驱动所述车辆，而运将是在故障模式下。 Wide difference in operation with ordinary electric vehicle that the engine is not used to charge the energy storage system, but is also used to directly drive the vehicle, and the operation will be in a failure mode. 充电也是通过基于机会的车辆惯性来完成的。 The charge is based on the opportunity by the vehicle inertia to complete. 所述机会可W是制动、减速、下坡或空转。 The opportunity may be W is braking, deceleration or downhill idle. 能量存储系统容量在运种配置中不高，但在减速和制动期间它将每隔一定时间补足充电除了环境基准之外。  The energy storage system is not high capacity transport configurations but during deceleration and braking will supplement charge intervals except the reference environment. 运显著降低当电池容量变小时的解决方案的成本。 Transport significantly reduced when the battery capacity becomes small cost solutions. 它也提高了系统的效率，因为静负载减少。 It also improves the efficiency of the system, because the static load is reduced. 假如能量存储系统不被充电时，车辆可W对发动机操作，所述系统可W通过利用再生制动能量作为轻度混合电动车运转。 If the time is not charged energy storage system, the vehicle engine can operate W, W may be by using the system of regeneration as a mild hybrid electric vehicle operation. 现在，车辆操作可W被划分成在不同的类别中达到一定的速度，如发动(0至20公里每小时）、巡航、加速、减速、动力和制动。  Now, operation of the vehicle W may be divided into up to speed in different categories, such as the launch (0 to 20 km / h), cruising, acceleration, deceleration, and braking power. 表8根据车辆的状态示出发动机和一个或多个马达的各种指示性操作模式。  Table 8 shows the state of the vehicle according to the various modes of operation of the engine and indicative of one or more motors. 在一个实施例中，用于将车辆配置成混合电动车的系统包括一个或多个电力齿轮组件，运些电力齿轮组件对于改装系统来说是可配置到现有车辆中的传动轴，如丘陵地形。  In one embodiment, the configuration for the vehicle to hybrid electric vehicle power system includes one or more gear assemblies, the gear assembly for the operation of these electric power conversion system is configurable into an existing vehicle drive shaft such as hilly terrain. 其中，没有配备运种系统的车辆可配备EPGA在走丘陵地形之前为了额外功率提升。 Among them, there is no transport vehicles equipped with such systems can be equipped with additional power in order to enhance the EPGA before walking hilly terrain. 在运种情况下，所述EPGA将具有预先装配的改造后的传动轴，W便减少装配时间。 In the transport case, the drive shaft having EPGA after transformation, pre-assembled, W will reduce the assembly time. 运将使拆除现有的传动轴和及时装配具有EPGA的新传动轴成为可能。 Yun will remove the existing shafts and timely new drive shaft assembly has EPGA possible. 本发明中所描述的系统增加离合器和发动机寿命由于不需要频繁更换齿轮并且也不会让引擎过度超载。 System  The present invention is described in increasing the life of the clutch and the engine does not require frequent replacement due to the gear and the engine does not make excessive overloading. 电源的再生通过电力制动，即通过电力负荷下降速度提供益处，诸如增加离合器的寿命，增加了制动蹄片与制动鼓的寿命，发动机的寿命W及节约了制动油。 Regenerative power supply through the power braking, providing benefits by lowering speed of the power load, such as increasing the life of the clutch, increasing the lifetime of the brake drum and brake shoes, the lifetime of the engine and saving W brake oil. 虽然该系统的发明已经结合在附图中示出的本发明的实施例描述，但并不限于此。  Although embodiments of the invention the system of the present invention illustrated in the drawings has been described in conjunction with, but not limited thereto. 但显然本领域技术人员在不脱离本发明的范围和精神的情况下可W对其进行各种替换，修改和改变。 It will be apparent skilled in the art without departing from the scope and spirit of the invention W may be subjected to various alterations, modifications and variations. 1. 一种用于将车转换成混合电动车或电动车的改装系统包括： 电源(EPS)，包括一个或多个马达，用于向车辆提供故障安全扭矩和用于对一个或多个电池充电的电线束制动能量； 一个或多个可连接的电力齿轮组件(EPGA)，配置为耦合所述一个或多个马达到传动轴以提供扭矩给车辆;以及耦合到电源(EPS)的电子控制单元用于动态控制基于运行条件的一个或多个马达的运行来驱动车辆。 1. A method of converting the vehicle to a hybrid electric vehicle or an electric vehicle for the retrofit system comprising: a power supply (EPS), comprising one or more motors, and to provide a fail safe torque for one or more batteries of the vehicle the braking energy charging wire bundle; a plurality of power or gear assembly (EPGA) connection configured to couple to the one or more motors to provide torque to the vehicle drive shaft; and electronically coupled to the power supply (EPS) of control means for dynamically controlling the operation of one or more operating conditions based on the motor to drive the vehicle. 2. 如权利要求1所述的系统，其中，所述一个或多个可连接的电力齿轮组件配置为连接一个或多个电源到传动轴，所述的电源至少为位于垂直位置和平行位置中的一个。 2. The system according to claim 1, wherein said power gear assembly or a plurality of connections configured to connect one or more power to the drive shaft, said power supply is at least in a vertical position and a position parallel one of. 3. 如权利要求1所述的系统，还包括发动机控制系统(EMS)，用于通过取得油门输入来控制车辆的发动机，所述油门输入包括但不限于:车速、废气排放、发动机温度以及加速度。 3. The system according to claim 1, further comprising an engine control system (the EMS), for controlling the engine throttle input made by the vehicle, a throttle input, including but not limited to: vehicle speed, exhaust emissions, engine temperature, and acceleration . 4. 如权利要求1所述的系统，还包括受电子控制单元控制的一个或多个马达控制器，用于控制运行的马达以及提取的功率的量以提供在车辆的每个操作点所需的扭矩。 4. The system according to claim 1, further comprising a motor controller or a plurality of control by the electronic control unit, and extracting the amount of power the motor control to provide a desired operation for each operating point of the vehicle of torque. 5. 如权利要求1所述的系统，其中，所述电子控制单元配置为使得一个或多个充电单元使用制动能量来充电一个或多个电池。 5. The system according to claim 1, wherein said electronic control unit is configured such that a plurality of charging units or braking energy used to charge one or more batteries. 6. 如权利要求1所述的系统，其中，所述一个或多个电力齿轮组件是可配置的，以便改装所述系统到车辆的传动轴。 6. The system according to claim 1, wherein said one or more power gear assembly is configured so as to retrofit the system to the drive shaft of the vehicle. 7. 如权利要求2所述的系统，其中，所述至少一个可连接的电力齿轮组件配置为将至少一个电源与传动轴垂直连接。 7. The system according to claim 2, wherein said at least one power connection gear assembly may be configured to connect the at least one vertical power transmission shaft. 8. 如权利要求7所述的系统，其中，所述至少一个可连接的电力齿轮组件包括至少一个双曲面异形冠和至少一个小齿轮装置。 8. The system according to claim 7, wherein said at least one power connection gear assembly may comprise at least one double crown shaped surface and at least one pinion gear. 9. 如权利要求2所述的系统，其中，所述至少一个可连接的电力齿轮组件配置为连接至少两个电源到传动轴，其中至少一个通过EPGA的冠垂直于传动轴，其他的至少一个平行于传动轴。 9. The system according to claim 2, wherein said at least one power connection gear assembly may be configured to connect at least two power to the drive shaft, wherein the at least one crown by EPGA perpendicular to the shaft of the other of the at least one parallel to the drive shaft. 10. 如权利要求2所述的系统，其中，所述至少一个可连接的电力齿轮组件配置为通过万向节连接至少两个传动轴。 10. The system according to claim 2, wherein said at least one power connection gear assembly may be configured to connect at least two drive shaft via a universal joint. 11. 如权利要求2所述的系统，其中，所述至少一个可连接的电力齿轮组件配置为连接至少两个电源到传动轴，其中，至少一个垂直于传动轴，以及其他的至少一个平行于所述传动轴。 11. The system according to claim 2, wherein said at least one power connection gear assembly may be configured to connect at least two power to the drive shaft, wherein the at least one vertical to the shaft, and at least one parallel to the other said drive shaft. 12. 如权利要求2所述的系统，其中，所述至少一个可连接的电力齿轮组件配置为通过驱动从动齿轮将至少一个电源与所述传动轴平行连接。 12. The system according to claim 2, wherein said at least one power gear assembly configured to be connected to at least one power source connected to said drive shaft by a drive parallel to the driven gear. 13. 如权利要求1所述的系统，还包括全球移动系统(GSM)通信用于发送车辆相关的信息至网络服务器，从而使网络服务器能监视车辆的工作状态和车辆的位置。 13. The system according to claim 1, further comprising a Global System for Mobile (GSM) communications for transmitting information to a network server associated with the vehicle, so that the network server to monitor the position of the vehicle and the operating state of the vehicle. 14. 一种混合电动车，包括： 两个或两个以上的轮子，通过从传动轴接收到的扭矩来推动车辆； 电源(EPS)，包括一个或多个马达，用以提供故障安全扭矩给车辆以及电线束制动能量以充电一个或多个电池； 一个或多个可连接的电力齿轮组件(EPGA)，配置为耦合所述一个或多个马达到传动轴用于提供扭矩给车辆； 耦合到电源(EPS)的电子控制单元用于动态控制基于运行条件的一个或多个马达的运行来驱动车辆;和一个或多个电池用于向电源(EPS)和所述车辆所配置的一个或多个电气设备提供电能，当所述电源(EPS)作为发电机运行时，所述一个或多个电池充电， 其中，所述一个或多个可连接的电力齿轮组件配置为连接一个或多个电源到传动轴， 所述的电源至少为位于垂直位置和平行位置中的一个。 14. A hybrid electric vehicle, comprising: two or more wheels by receiving the torque from the propeller shaft to propel the vehicle; a power supply (EPS), comprising one or more motors for providing torque to failsafe and wire bundle vehicle braking energy to charge one or more batteries; a power gear assembly (EPGA) one or more connections, configured to couple one or more of the motors to the drive shaft for providing a torque to the vehicle; coupling to the power supply (EPS) for an electronic control unit for controlling the dynamic operation of the vehicle driving one or more motors based on the operating conditions; and for one or more batteries configured to supply (EPS) or of the vehicle and a a plurality of electrical devices to provide electrical energy, when the power supply (EPS) when used as a generator, the one or more batteries, wherein the one or more power gear assembly may be configured to connect connections to one or more power to the drive shaft, said power supply is at least in a vertical position and parallel position. 15. -种电动车，包括： 两个或两个以上的轮子，通过从传动轴接收到的扭矩来推动车辆； 电源(EPS)，包括一个或多个马达，用以提供故障安全扭矩给车辆以及电线束制动能量以充电一个或多个电池； 一个或多个可连接的电力齿轮组件(EPGA)，配置为耦合所述一个或多个马达到传动轴用于提供扭矩给车辆； 耦合到电源(EPS)的电子控制单元用于动态控制基于运行条件的一个或多个马达的运行来驱动车辆;和一个或多个电池用于向电源(EPS)和所述车辆所配置的一个或多个电气设备提供电能，当所述电源(EPS)作为发电机运行时，所述一个或多个电池充电， 其中，所述一个或多个可连接的电力齿轮组件配置为连接一个或多个电源到传动轴， 所述的电源至少为位于垂直位置和平行位置中的一个。 15. - kind of an electric vehicle, comprising: two or more wheels by receiving the torque from the propeller shaft to propel the vehicle; a power supply (EPS), comprising one or more motors to provide torque to the vehicle failsafe and wire bundle braking energy to charge one or more batteries; a power gear assembly (EPGA) one or more connections, configured to couple one or more of the motors to the drive shaft for providing a torque to the vehicle; coupled to power supply (EPS) for an electronic control unit for controlling the dynamic operation of the vehicle driving one or more motors based on the operating conditions; and for one or more batteries configured to supply (EPS), and one or more of the vehicle device provides electrical power, when the power supply (EPS) when used as a generator, the one or more batteries, wherein the one or a plurality of gear assembly may be power connections configured to connect one or more power to the drive shaft, said power supply is at least in a vertical position and parallel position.